Imagine a force that can toss boats around like toys, wash away bridges, create waves as high as eighteen feet, and change the shape of a shoreline. With fierce winds and torrential rains, hurricanes can do all of these things. In this newly revised edition, Gail Gibbons introduces readers to the concepts of hurricane formation, classification, weather preparedness, and the ever-evolving technology that helps us try to predict the behaviour of these powerful storms. Extensive updates include refined definitions for hurricane-related vocabulary, updated information about the wind speeds that define hurricane categories, information on emergency preparedness, and more. As these weather disturbances become more frequent and more powerful, Hurricanes is the perfect introduction for children to this important and timely topic. What in the world is a hurricane? 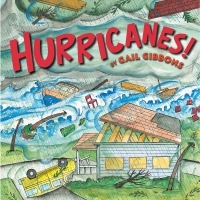 In this age of extreme weather, this newly updated edition of Gail Gibbons' informative introduction to hurricanes, with safety tips included, answers that question.